Back along, feeling traumatised after my various roulade misadventures, I was in need of something a little simpler. Having skimmed through a chocolate baking book I was given a few years ago, but still hadn’t actually used, I thought it was time I did so. Greatest Ever Chocolate is perhaps not the catchiest of titles and it doesn’t have an author, only stating it was published by Papplewick Press in 2002 – this could be why I hadn’t taken much notice of it up until then. However, Chocolate crispy bites using rice crispies had caught my eye after the pleasure derived from the cornflake Easter Nests I made earlier this year. So chocolate crispy bites it was. My only change was to use the Co-op’s fairtrade dark chocolate with spices and orange oil rather than just plain dark, oh and CT suggested a catchier name: two tone crispies. Melted 150g white chocolate (G&B) in a large bowl over hot water along with 55g unsalted butter and 1 tbsp golden syrup. Stirred in 50g puffed rice. Gently pressed into a 22cm round silicone flan dish. Used same bowl to melt 125g orange flavoured dark chocolate with 55g unsalted butter and 2 tbsp golden syrup. Stirred in 75g puffed rice. Gently pressed this on top of the white layer and left to set. Turned out of the mould and cut into squares, snaffling the round edgy bits as I went. These were as good as I expected them to be – light, moreish and very simple to make. A nice twist on a children’s classic, the two tones made for a visually interesting appearance. The orange flavour gave a hint of sophistication and the white chocolate made for a sweet contrast. I am now thinking these would make good party food using chilli chocolate for a suprise kick! This also seemed like a good opportunity to try out one of the new pieces of silicone ware I won recently. I was rather drawn to having this in slices, but at the last minute, changed my mind and went for the small squares prescribed in the book. Now who doesn’t like chocolate rice crispies. I never thought of two tone ones. Lovely idea. They look great – sweet and simple! Love the two tone effect, and like your idea of using chilli chocolate! Comfort eating that takes you back to being a child when life was carefree. Such a great twist on an old classic! RhyleysGranny – they’d be good anyway, but this makes them a bit more special. Shaheen – oh for the days! Maggie – good idea, beetroot juice perhaps? Gloria – you are always very kind – thank you. 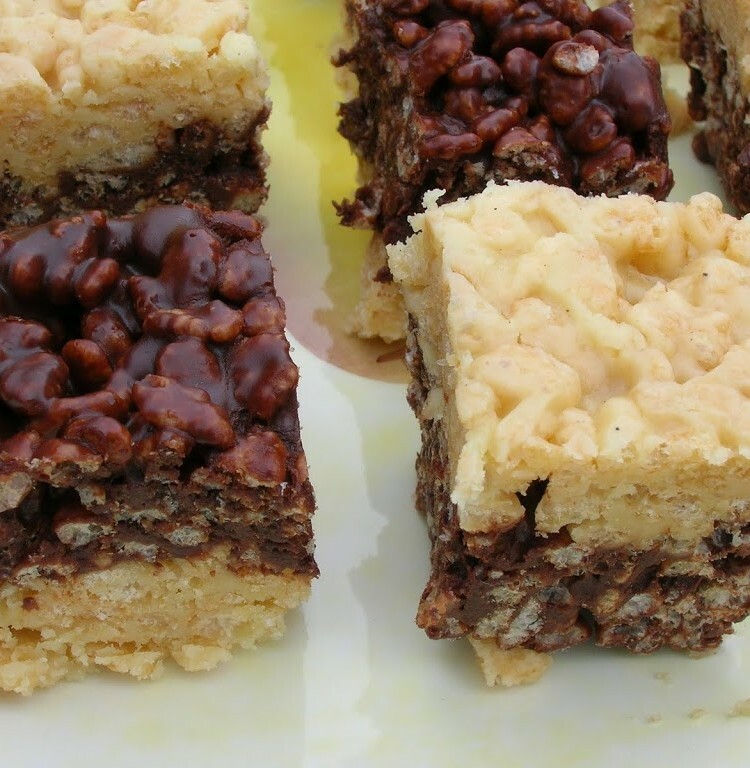 I love crispie squares and making them two tone is a great idea. Johanna – oh yes a kid’s party. It’s so easy and simple and the kids will love it, you could always use milk chocolate instead of plain. CC – you are so right. Maggie – it’s fun to have a twist on an old favourite. What a good idea! I must try it out. I’m loving the sound of the orangey choc flavour. Ohlala I love this idea. Definitely one for rainy days during the holidays (ever the realist!). Those are the fanciest rice crispy cakes I have ever seen! Lovely! Suzler – it’s fun doing something a bit different from time to time. Chocolate Here – well a few rainy days would be good, but not too many please! Oxslip – great idea for work. Why didn’t I think of that? Can’t imagine many turning their nose up at these. Chele – oh dear, what were the unproper treats you used to get?